A dedicated rural community based project to facilitate improved reporting using targeted promotional materials and signage. Now being used extensively across Dorset. Rural communities told us they felt isolated, exposed and vulnerable. Residents often know names of offenders in their midst but are anxious re contacting the Police. The ‘Rural Crimestoppers’ anonymity aspect effectively addresses this concern by being relevant to the rural community. A dedicated rural community based project to facilitate improved reporting. During a consultative meeting with rural Partnership agencies and residents, it was clear their view of ‘Crimestoppers’, involved primarily urban environments to inform the Police of drug dealing, burglaries and drink drivers. The Crime stoppers Charity was approached and a ‘Rural Crimestoppers’ campaign planned for East Dorset. Rural communities old us they felt isolated, exposed and vulnerable. Residents often know names of offenders in their midst but are anxious re contacting the Police. The ‘Rural Crimestoppers’ anonymity aspect effectively addresses this concern by being specifically relevant to the rural community. Funding for leaflets and Signs was obtained and a Formal Press Launch took place. Research of rural crime highlighted a lack of intelligence and information despite anecdotal evidence that communities knew much more about the issues. 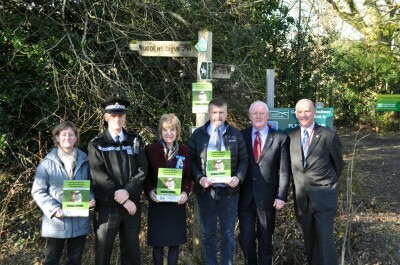 Rural Crimestoppers is now being actively utilised across the rural areas of Dorset. Rural communities tell us they feel isolated, exposed and vulnerable. Residents often know names of offenders in their midst but are anxious re contacting the Police. The ‘Rural Crimestoppers’ anonymity aspect effectively addresses this concern by being relevant to the rural community. Met with partners including East Dorset District Council, NFU and Crimestoppers to discuss the identified problem and obtain support and funding. The NFU, Crimestoppers, Force Media unit and The High Sherriff of Dorset. All the above gave their support and attended a Press Launch. This was launched in conjunction with Operation Midas and Police rural crime training. The signage used is very effective making use of cartoon type characters. Involvement with influential partners such as the NFU which goes a long way to gaining the trust of rural businesses. Posters and some press coverage alone is not sufficient. Promotion of the scheme is critical and posters, leaflets, social media etc must all be deployed otherwise the message doesn’t get out there. Residents now feel that information they may have can be given to the Police via ‘Rural Crimestoppers’ without fear of reprisals. Rural Crimestoppers is now being used as part of the step up in our response to rural crime. An intelligence gap from rural communities, organisations, businesses etc has clearly been identified and Rural Crimestoppers is one of the key components in addressing that. Information received through Rural Crimestoppers must be acted on decisively whenever possible. The information must be captured within the Force recording mechanisms and shown under the appropriate flagging and codes, this aids both initial response and later research. The control room and call takers must fully be aware of and understand the scheme.